For an interpretation of other famous examples of portraiture, please see: Famous Paintings Analyzed (1250-1800). Although he died at the height of his powers, at the comparatively young age of 45, Hans Holbein the Younger was one of the best portrait artists of the 16th century, and the rightful heir to the traditions of Flemish painters, like Jan van Eyck (1390-1441) and Petrus Christus (1410-75). Trained in Augsburg by his father, Hans Holbein the Elder (1465-1524), he moved to Basel to find work - mostly Protestant Reformation Art, such as his woodcuts like "Christ as the Light of the World" and "The Selling of Indulgences", illustrating Luther's struggle against Rome. However, the fall in demand for large scale religious paintings (banned by Lutheranism) crippled the traditional market for Northern Renaissance art, and led to Holbein moving to England in seach of work. Armed with a recommendation from Erasmus of Rotterdam, he was welcomed into the humanist circles around Sir Thomas More, and rapidly became known for his outstanding portraiture. During this first visit to England (1526-28) he was not employed by Henry VIII (reigned 1509-47), although he did paint the portraits of several courtiers and noblemen. Like most Northern Renaissance artists, he was a committed believer in the value of preliminary drawing and sketching, typically adopting the methods of the French portrait artist Jean Clouet (14801541) who used chalk drawings on unprimed paper for his preliminary studies. Holbein probably executed several portraits of Sir Thomas More, although only two are known to have survived - this one, now in the Frick Collection, and a closely related drawing with bodycolour, now in the Royal Collection. In addition, there are several other drawings of More by Holbein in the Royal Collection. Sir Thomas More (1478-1535) was a humanist scholar and statesman, who rose to power under Henry VIII, becoming a Privy Councillor, Speaker of the House of Commons (1523) and Lord Chancellor (1529-32). Later, he resigned as Chancellor in protest at Henry's proposed divorce from Catherine of Aragon, and then refused to agree to Henry becoming supreme head of the English Church. As a result he was convicted of high treason and beheaded. Venerated as a martyr by the Catholic Church, he was canonized in 1935. 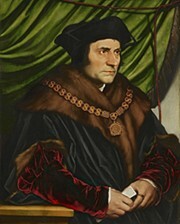 Holbein's portrait of Sir Thomas More was painted in 1527, when More held the office of Chancellor of the Duchy of Lancaster. The picture, a half-length portrait, shows More in three-quarter profile seated against a shallow backdrop of green drapes. He is wearing his official robes as well as his Collar of Esses, with the Tudor rose badge of Henry VIII. This chain signifies service to the King, not any specific office. He looks off to the right, with an expression that is both severe and watchful. The watchfulness might have been caused by political strife at the Tudor royal court, but the severity stemmed from More's own religious certainty. It is worth noting, for instance, that despite his saintly qualities he was still able to order heretics to be burned at the stake. There is little sign in the portrait of More the scholar, although some art experts consider that Holbein alludes to this in the figure's slight stoop. Holbein's Renaissance colour palette of red and green may also be symbolic. In medieval art, the colour red was associated with power and importance, and also with martyrdom. It is also the Christian liturgical colour for atonement and humility. Meanwhile, green is often used to represent the idea of a 'revelation' - derived from the feast of Epiphany when Jesus's divinity was revealed to the Three Kings. In view of Holbein's penchant for allegory and symbolism, it is quite likely that he deliberately chose these colours to convey some sort of message, although its exact nature is far from clear. Perhaps he was suggesting that Sir Thomas More would end up as a martyr unless he had a radical change of attitude. Note: Other pictures executed by Holbein during this time, include portraits of: Sir Henry Guildford (1527, Royal Collection, Windsor Castle); his wife Mary, Lady Guildford (1527, Saint Louis Art Museum); William Warham, Archbishop of Canterbury (1527, Louvre, Paris); and Thomas Godsalve and his son (1528, Gemaldegalerie Alte Meister, Dresden).  For more outstanding paintings from the Tudor period in England, see: Homepage.